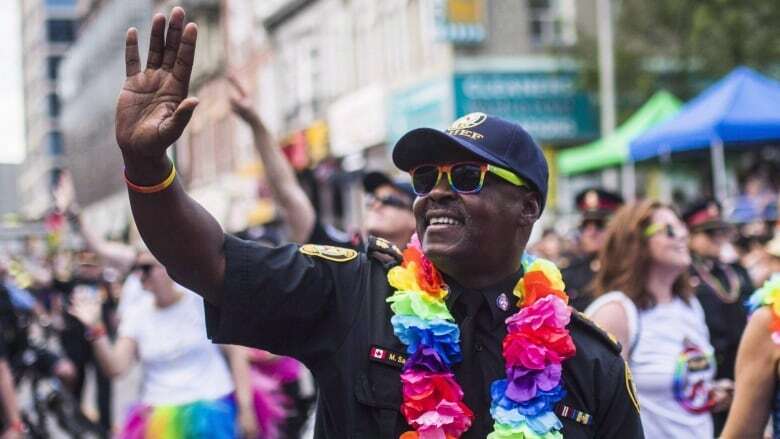 Toronto police have withdrawn their application to march in uniform in this summer's Pride parade, according to Chief Mark Saunders. The force's decision to make a bid last month to rejoin the parade after being banned last year stirred controversy in the city's LGBT community. Late Monday night, Pride Toronto and five other organizations co-signed a letter calling for police to abandon the effort, citing the strained relationship between the LGBT community and Canada's largest municipal police force. "On multiple recent occasions, I have expressed my sincere commitment to the cause of strengthening and renewing the relationship between the Toronto Police Service and our city's LGBTQ2S community," Saunders said in a statement. "That being said, I am conscious of the need to avoid any setback that might undermine the principle objective of coming together and restoring confidence ... My hope is that this move will be received as a concrete example of the fact that I am listening closely to the community's concerns and I am committed thoroughly to building a better, stronger relationship between us." Toronto police were banned from last year's event after activists with Black Lives Matter disrupted the 2016 parade, in part demanding that uniformed officers no longer participate. Since late last summer, Pride Toronto has been in closed-door talks with police brass in an effort to reach a compromise and help improve the relationship between officers and the LGBT community. In an interview with CBC's Metro Morning earlier Tuesday, Pride Toronto executive director Olivia Nuamah said the investigation into alleged serial killer Bruce McArthur has widened the schism between LGBT residents and police. 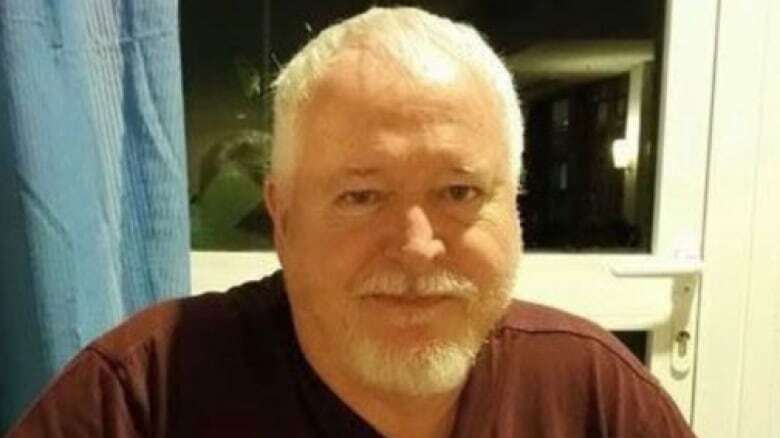 McArthur, 66, was arrested on Jan. 18 and later charged with six counts of first-degree murder for the deaths of six men who had ties to the Church and Wellesley neighbourhood, often called the Gay Village. News of his arrest came little more than a month after Saunders said publicly that there was no evidence to suggest a serial killer was linked to the disappearance of LGBT residents. Nuamah said that until that point, talks with police were "going very well." "What changed was Bruce McArthur, to be honest with you. What changed was the re-emergence of that feeling, of that feeling of a lack of safety." Several LGBTQ groups have said police did not seriously consider community fears that a serial killer was targeting men in the gay village. Relations were further strained when Saunders told a newspaper in February that "nobody" came to officers with information in 2012, when police launched an ultimately unsuccessful investigation into men missing from the area. "Pride was born out of protest. It actually was born out of resistance to police," Nuamah told The Canadian Press. "That's the context in which the community feels shaken, and it comes together to show strength and unity." Speaking to reporters, Toronto Mayor John Tory said he's hopeful discussions will continue between police and Pride, but recognizes the difficult circumstances that have led to where they are today. 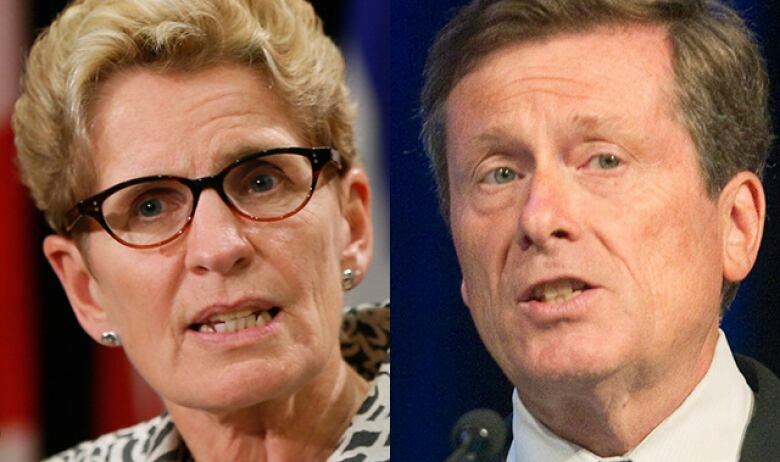 "I want everyone to be in Pride," Tory told reporters. The mayor says he's "heartened" to see that conversations about police involvement have taken on a constructive, not adversarial tone. "I'm hopeful those discussions will continue," he said. Tory added he wants this summer's parade to be a success that enjoys the full support of the city. Last year, some councillors called for city funding for the event to be pulled. Ontario Premier Kathleen Wynne said she, too, was hopeful that police would improve relations with the LGBTQ community. "I truly hope that there can be a good discussion between Pride and the police services so that that relationship can be healed," she said. "But I do understand with all the things that have happened over the last year that it's a strained relationship right now." 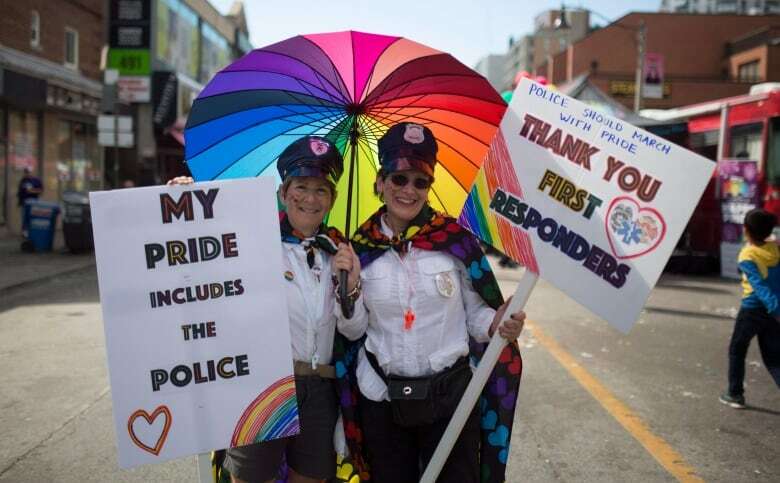 Individual officers will still be allowed to participate in the parade if they leave their uniforms, cruisers and guns at home, as those are police symbols that make the LGBTQ community feel unsafe, Nuamah said. Police presence at the parade emerged as a contentious issue in 2016. That year, the march was interrupted by the local chapter of Black Lives Matter, which said it opposed uniformed officers being in the parade because their presence could discourage marginalized communities from participating. ​The issue was thrust under the spotlight again in January last year, when Pride Toronto adopted a list of demands issued by Black Lives Matter that included banning police floats from the parade. The following month, Saunders announced the force would not be participating in 2017's event. On Tuesday, the chief said he had hoped to see uniformed officers invited back to march in the 2018 parade, but said he understands that insisting they be allowed to participate could set back progress made with the community. Mike McCormack, president of the union that represents Toronto police officers, said he thinks Saunders made the wrong move. "We don't think this fosters a conversation or a narrative that's positive," he said. "We think that this type of action drives a wedge deeper in the community and policing, and it's disappointing to our members." But Alok Mukherjee, the former chair of the Toronto Police Services Board and a visiting professor of criminology at Ryerson University, said he feels Saunders made the right call. "It's important to understand the depth of feeling that exists right now in the LGBTQ community generally, but particularly the racialized members of that community," he said. "There's a perception that the work that was done before in terms of building relationships between police and the LGBTQ community did not pay adequate attention to the fact that it's not a homogenous group." Given those feelings, Mukherjee said, it's important that police try to defuse tensions and build a better relationship with all community members.